- 15 days before the checkin date, the total amount paid is converted into credit that can be used in another period or transferred toanother name, until 1 (one) year counting from the checkin date (not included extras as beverages or transfers). - From the 14th day on, 50% will be converted into credit. - The credits can not be used in special date as Carnival or New Year's Eve. - There’s no conversion of the amount paid into credit. - It will be charged the total amount of the reservation. - The check-in begins at 2 p.m. The check-out is until midday. We charge it in the moment of the reservation. In case of pending amount, th payment must be done at the check-in. If the guest do not checkout until 12a.m. will be automatically charged a late checkout penalty of 50% of the day price. - Children under 4-years-old will be accommodated for free in additional beds depending on our availability. It is not allowed the accommodation of children under 10-years-old in shared rooms. People under 18-years-old only accompanied by legal guardian. - The hostel is not suitable for wheelchairs. - We do not offer parking slots. - Breakfast: Is served between 8 and 10:30 a.m.
- The reservation in shared bedrooms gives to the guest the right to the use of one bed only. - Early checkin or late checkout costs halft of the daily price, but it is only accepted in shared bedrooms and under previous consultation. 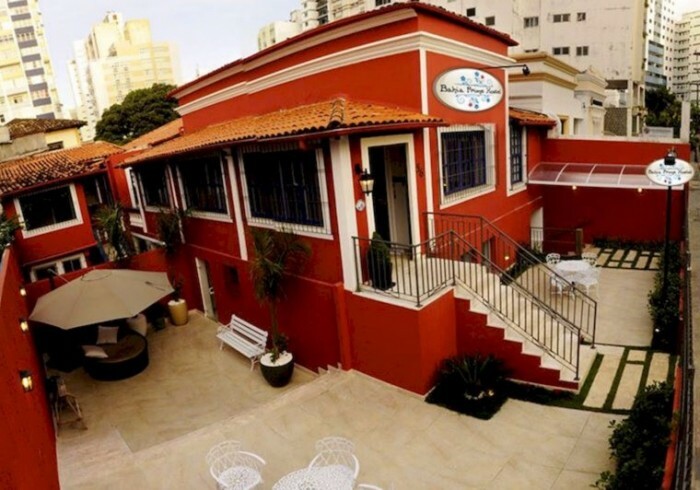 Located in a brazilian colonial style house, with almost 100 years of history, and 900m² of area in the traditional neighborhood of Barra, the hostel was completely reformed to provide excellence to visitors from all around the world. We have not only bedrooms for 12 and 18 people, but also we offer privacity in a room with a double bed, or in a suite. We dispose of cable TV in the lobby, ar-condiotioning in all the rooms, individual cabinets with key, free wi-fi, and 24 hours camera monitored environments.